When the temperatures drop, the Polar Bears Plunge! The Polar Bear Plunges for Special Olympics New Jersey are fundraising events in which participants pledge $100 or more to take a brazen romp into the chilly waters of the Atlantic Ocean in the middle of Winter. Crazy? We think so. And we know lots of folks who agree … and who still take the Plunge for Special Olympics New Jersey year after year. Whether you’re the type who jumps into cold water or someone who inches in, with two choices of locations, we have a winter Plunge for you. The annual Seaside Heights Plunge, scheduled for February 26, 2011, has grown to more than 4,500 participants who travel from as far as California to be a part of the fun. Radio station NJ 101.5’s Big Joe Henry, “the Voice of the Plunge” broadcasts live from the Aztec Ocean Resort, site of the Plunge, with interviews, updates and a countdown to Plunge you won’t want to miss. Registration begins at 9 a.m. with the Plunge scheduled for 1 p.m. The Wildwood Plunge will take place January 15, 2011 at The Wildwoods Convention Center. This Annual Plunge is catching on throughout southern Jersey and beyond. Complete with hot tubs and indoor facilities for registration and changing, the Wildwood Plunge has grown in popularity each year. Both of these Plunges are sponsored by the Law Enforcement Torch Run, a volunteer effort by the Law Enforcement community of New Jersey to raise funds and awareness for Special Olympics New Jersey. The Law Enforcement Torch Run for Special Olympics New Jersey was ranked number two in the world for raising more than $2.4 million in 2009. Special Olympics New Jersey provides year-round sports training and Olympic-type competition in 24 sports for more than 21,000 children and adults with intellectual disabilities, all completely free of charge. Compared with other types of cancer, testicular cancer is rare. But testicular cancer is the most common cancer in American males between the ages of 15 and 34. Testicular cancer is highly treatable. Regular testicular self-examinations can help identify growths early, when the chance for successful treatment of testicular cancer is highest. 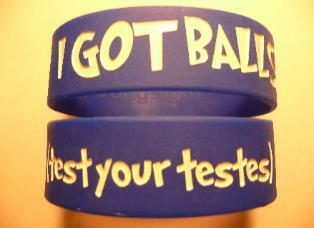 These silicone rubber wristbands are a fun way to raise awareness about testicular cancer and screening. These 1″ wide wristbands are available in black, blue, purple, green and even pink for the girls who care about the cause too. All bands are adult sized to fit just about everyone. It’s a route that many students are taking nowadays because it allows them the freedom to do many things simultaneously while providing them with a great deal of flexibility too. Online education is in high demand because you can earn while you learn, you don’t have to spend as much as you do on traditional degrees, and you can stay at home and avoid the significant changes that college entails. However, when you study online, it’s best to take a proactive approach to prevent health problems, both minor and major. · You’re at risk for illness when you don’t get enough exercise and stay all day at home; so no matter how much work you have, no matter that you’ve always been a couch potato who has never exercised, it’s time to start right now. When you work out for at least half an hour a day, you prevent all kinds of diseases and keep illness at bay. A short, brisk walk is enough to rejuvenate you and boost your energy. · You could be stressed out if you have too many things on your plate – studying, working and having to balance social and familial obligations could become too much to handle and you start falling sick or feeling down more often. Regular exercise and taking time out to enjoy yourself once in a way helps reduce the burden you carry and lightens and raises your spirits. · One of the downsides to online education is that it isolates you and removes you from the social aspect of education. You don’t get to interact with teachers and classmates, and this makes concentration and studying a little more challenging. Some students thrive and flourish in this kind of environment; others however, start to pine for some form of human contact and this affects their mental and physical health. The solution to this problem is to seek out other learners close to where you live and form study groups whenever time permits; if this is not possible, try and form virtual groups and use video and voice chat to enhance your learning. · When you spend most of your time at home or in front of the computer, you tend to eat whatever is available and easily ready in a short time. Junk food forms a major part of your diet, and before you know it, your health suffers and your weight balloons up. So make a conscious effort to eat healthy – salads and juices if you don’t have time to cook, and sandwiches made with whole-wheat bread and filled with nutritious food instead of fatty meats for your meals will do your mental and physical health a world of good. The best way to look after your health when you study online is to be proactive and take charge of it right from the word go – it’s easy to prevent obesity and illness rather than fight them after they’ve taken root. This guest post is contributed by Carrie Oakley, who writes on the topic of online college . Carrie welcomes your comments at her email id: carrie.oakley1983(AT)gmail(DOT)com. You do everything you can to keep your heart healthy—exercise, take aspirin and avoid foods that are prone to clog your arteries. But did you know one of the key ways for ensuring a strong, healthy heart is to simply brush your teeth? According to research, keeping your teeth healthy by removing plaque from your pearly whites and flossing on a regular basis will in-turn keep your heart healthy. This is because if you don’t remove that gummy dental plaque—the filmy bacterium that builds up on your teeth throughout the day— you can get gum disease. And gum disease sparks a different kind of plaque, the kind that clogs your arteries. The disease is called atherosclerosis and as mentioned briefly above, it’s the waxy buildup of plaques that form along the walls of the arteries. These plaques are dangerous, having the possibility to create a blood clot that can shoot straight to the heart or brain causing a heart attack, stroke or aneurism. Atherosclerosis doesn’t occur immediately. It’s typically a slow process that begins when you experience body-wide inflammation. And what causes this inflammation? Gum disease. To prove what many dentists and cardiologist have known for years, researches at the University of Connecticut Health Center confirmed the link between gum disease and atherosclerosis. Published in the New England Journal of Medicine, researchers gathered 120 adults who suffered from severe gum disease and atherosclerosis. Half were randomly selected to undergo routine dental cleaning while the other was assigned to receive extensive treatment to heal their infected gums. This meant not only aggressively removing plaque, but also extracting any unsalvageable teeth and supplying patients with antibiotics to treat the infected gums. Within two months, those who underwent intensive treatment greatly improved the condition of their arteries more than those who only received routine dental cleaning. These improvements were still present after six months, according to the study. So how to fight off gum disease and prevent atherosclerosis? Brush your teeth. Experts recommend brushing your teeth two to three times a day or after every meal for at least two minutes. Make sure to brush along the gum line as well, as this is how gum diseases start. Flossing daily will also prevent the dental plaque from building up. Also, be on the lookout for gingivitis which is a precursor to gum disease. Common signs are puffy, red, tender gums. Lastly, visit your dentist and have a routine cleaning regularly, about every six months. This guest post is contributed by Kitty Holman, who writes on the topics of nursing schools. She welcomes your comments at her email Id: kitty.holman20@gmail.com. Heart disease is the #1 killer of Hispanic men and women in the U.S. Hispanics are at a higher risk to develop diabetes which is a strong risk factor for heart problems. Heart disease and diabetes risk factors specific to the Hispanic/Latino population will be discussed and strategies to reduce risk. Think you know all about nutrition and exercise? Try your luck at Food Hero, a new game created by a team at Children’s Hospital Boston. The free app is competing in a contest initiated by First Lady Michelle Obama’s Let’s Move campaign (you can vote until Aug. 14), but it’s also part of a larger strategy to use social networking to improve health. Ben Reis, a professor of pediatrics at Harvard Medical School, and his colleagues previously came up with apps that let your friends know when you give blood (I Saved a Life!) or get a flu shot (I Got the Flu Shot!). (You get the idea.) A future version of Food Hero would post your victories on your Facebook wall, for example. Complete with stirring music and multiple levels, Food Hero is aimed at kids who are 9 to 12 years old. Its cartoon characters run, bike, or swim, but to do their best they must eat a balanced diet. Eat too little and they droop; eat too much and they almost explode. It’s not as easy as it looks, by the way. 1 in every 3 young children are overweight or obese. Hispanic youths are more likely to be obese and are more likely to develop diabetes and heart disease as they get older. Hispanic kids of low-socioeconomic status consume too much total and saturated fat, cholesterol, added sugar and sodium. White children and teens watch 2 hours and 45 minutes of TV per day while Hispanic children watch 3 hours and 23 minutes per day. Hispanic children are less likely to exercise on a regular basis. Take a couple of minutes to watch this well done, informative video about the childhood Hispanic obesity epidemic. We are nurse practitioners﻿ who are also trying to educate hispanics to develop healthier lifestyles. We have an adult book ready to be published “TOME CONTROL DE SU SALUD Usted Puede Prevenir la Diabetes, un Ataque al Corazon o un Derrame Cerebral” which discusses (in Spanish) risk factors and prevention tips for heart disease, stroke and diabetes. Hispanic/Latino parent can help themselves and their children prevent heart disease, stroke and diabetes by developing healthy habits and lifestyles – this book will show you how! Please visit our website www.heart-strong.com for more info. You are currently browsing the archives for the kids health category.